We are excited to announce that Azure SQL Database and Azure SQL Data Warehouse VNET Service Endpoints are now in public preview in all Azure Public Cloud regions. 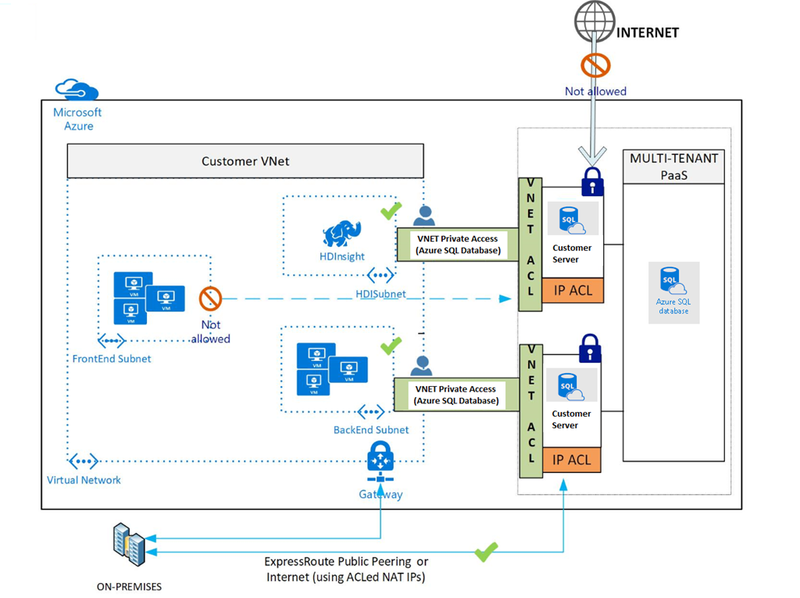 Does not extend to on-premises via Private Peering Express Route (Public Peered Express Route to Azure SQLDB is still supported), Site-to-Site (S2S) VPN, or Peered VNets. At the time of this preview, Network Security Groups (NSGs) should be opened to the Internet to allow Azure SQL Database traffic. In future, NSGs could be opened to only IP ranges for the PaaS services. IP tags for Azure SQL Database are on the roadmap for CY17. With VNET Service Endpoints, source IP addresses of resources in your VNet's subnet will switch from using public IPV4 addresses to VNet's private addresses, for traffic to Azure SQL Database. Any existing open TCP connections to your databases service may be closed during this switch. Please make sure no critical tasks are run when Service Endpoints is turned on or off. If traffic to Azure SQL Database is to be inspected by a network virtual appliance (NVA), it is recommended that VNET Service Endpoints is turned on for the NVA subnet, instead of the subnet where the Azure SQL Database is originating from in the given VNET. When Service Endpoints is turned on, a Subnet it is sequentially applied to all VMs in that Subnet. The call commits only when Service Endpoints is successfully applied to all VMs. You will be able to ACL given VNET/Subnet your Server only after Service Endpoints from the VNET/Subnet is successfully applied. So there can be potential downtime after the Service Endpoints call is issued until when you ACL the Server. To learn more check out VNet Service Endpoints and rules for Azure SQL Database.